Monitoriing wells at the Laurel Bay, South Carolina, Research Site. U.S. Geological Survey (USGS) scientists examined the natural attenuation and fate of methyl tert-butyl ether (MTBE). MTBE was a component of gasoline in a leaky underground storage tank that caused a plume of contaminated groundwater. This photo shows two rows of variably screened ("nested") monitoring points, screened from shallowest to deepest, left to right. 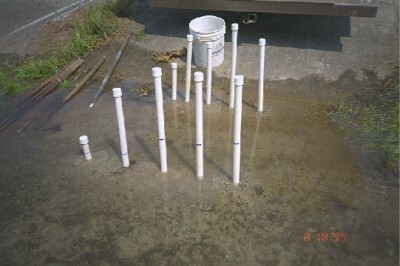 Blue marks on well casing indicate level of groundwater in well, with higher water-levels in deeper wells, indicating a location of groundwater discharge. Photo Credit: James E. Landmeyer, USGS. U.S. Geological Survey researchers have discovered that microorganisms that live in surface-water environments are, in fact, able to degrade methyl tert-butyl ether (MTBE) in the absence of oxygen if nitrate is available to support the metabolism of the microorganisms. Due to the high solubility of MTBE in water, MTBE has resulted in pervasive contamination of ground- and surface-water systems, especially at gasoline spill sites. Compounding the concern over environmental MTBE contamination is the long-held view that MTBE is not readily biodegradable in the absence of oxygen. Unfortunately, MTBE is often found in ground water that has been depleted of oxygen. Because nitrate is common in uncontaminated as well as contaminated surface-water systems, these findings indicate that naturally-occurring biodegradation can be an important tool for restoration of MTBE-contaminated environments. This information can be used by water-resource managers and others charged with protecting drinking water sources to better understand the real risks associated with MTBE contamination and to develop wise public water-supply policies.